Being on the party-planning committee at work might be a great distraction from business as usual, but when the RSVPs start rolling in, the pressure is on to get the party started! Having the right entertainment can mean the difference between a business bore-fest or a sensational soiree. Luckily, Charlotte is home to an award-winning professional event entertainment service that has everything you need to make your corporate holiday party a hit. ATG Entertainment does more than just DJ: Our highly trained entertainment specialists will transform your event venue with professional uplighting, party motivators, and more. Find out what your office parties have been missing by contacting our team today. Setting your night up for success starts with the entrance. Invite your coworkers for a night of dinner and dancing, guiding them into the venue with light background music to start as dinner is served and everyone gets settled. Once the final course hits the table, however, our entertainment masters will ensure no one is left in their seats. Your ATG DJ will raise the roof with popular tunes to please the crowd. You’ll even get to make playlist selections ahead of time through our online customer portal, so you can choose the songs you know will resonate with your team. The DJ services you choose can make dancing as simple or complex as you like. Our entertainment professionals can do it all, from dazzling light shows and snow machines to elegant uplighting. Build your custom party package by speaking to one of our entertainment experts today. What’s an office party without some employee recognition? Our expert MCs will keep the timeline of your event moving, providing microphones for special shout-outs and awards announcements. As if dinner and dancing weren’t enough entertainment, your DJ service also comes with available upgrades to make your party even more memorable. 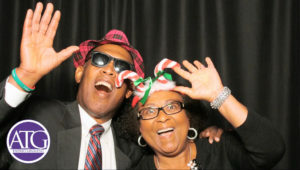 Add a photo booth complete with props for some crazy coworker pics you can treasure forever. We can even provide prizes of our own to increase interaction and make your party a huge success. Our professional entertainment service also provides team-building games and activities for even more company fun. Your corporate holiday party will not disappoint when you choose the right entertainment service. Tell us about your party plans so we can turn your fantasy fiesta into a reality. ATG Entertainment has proudly served the Charlotte metro area for nearly 20 years, and our team of entertainment experts has the training and skills necessary to throw the party of the century. Make your next corporate party the top watercooler discussion for years to come by contacting the entertainment professionals at ATG today.